Every year a gathering of people with a passion for the written and spoken word takes place in the verdant setting of West Auckland. Named after the Maurice Gee novel in which he vividly describes the train journey from Loomis (Henderson) to the city, writers and performers of all ages and backgrounds come together to participate in the Going West Books and Writers Festival. Since the festivals beginnings in 1996, guests and audiences alike have been attracted by the unique character of the location and the diversity of the programme. 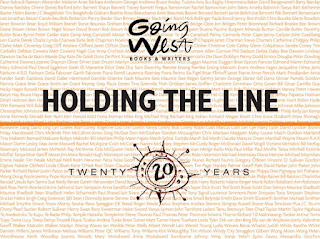 In 2015, Going West celebrates 20 years as a stalwart of the literary festival scene in New Zealand with ‘Holding the Line’, the theme for this year’s event that is an apt reference to the centenary of the Gallipoli campaign 100 years ago. 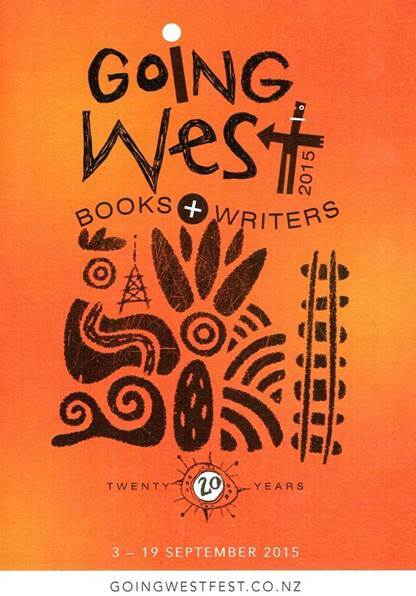 Ref: Going West Trust, 2015 Going West Books and Writers Festival branding, reproduced courtesy of the Going West Books and Writers Festival Collection, West Auckland Research Centre, Waitakere Central Library, Auckland Libraries, GOW-007-0023. ‘Then New Lynn and the Brickworks. Amalgamated and Crum: black open sheds stacked with orange pipes, chimneys with iron ladders up their sides, once in twenty years a steeplejack on top. We crossed the Whau creek – mud and mangroves – where the country ended and the suburbs began’. Maurice Gee, Going West, 1992. In 1992, a customer visiting Murray Gray’s bookshop in Parnell remarked on the evocative writing in Going West. That remark triggered an idea in Murray’s mind to recreate that train journey along the western railway line that traversed West Auckland. Murray’s friend Bob Harvey, who at the time was involved in the advertising industry, promised to make the event happen should his run for Mayor of Waitakere City be successful. 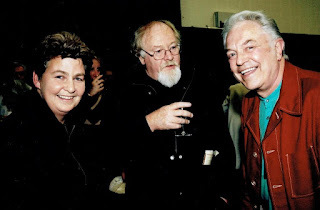 True to his word, Bob won the mayoralty and in 1996, with support from Waitakere City’s Arts Manager Naomi McCleary and the City’s first library Manager Adrian Birbeck, the Going West Festival was underway. The initial train journey was a success, with festival-goers travelling in carriages pulled by a vintage steam locomotive. The day was spent traversing both the geographical landscape and the equally inspiring literary landscape in the journey from the central city out to Helensville and back. Passengers soaked up the on-board atmosphere in between stops at New Lynn, Glen Eden, Henderson, Swanson and Helensville for food, drink and the many now legendary readings and performances from an assortment of writers, poets and artists. 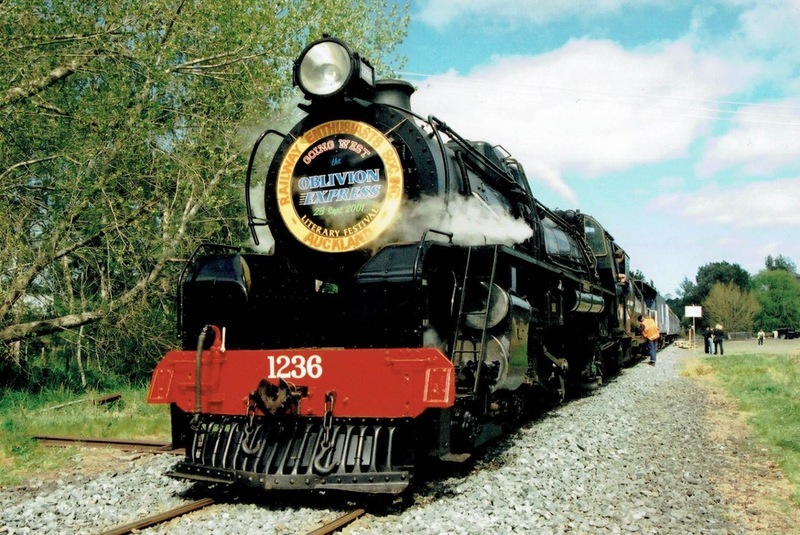 Ref: The ‘Oblivion Express’ steam train waits on the line, Going West Books and Writers Festival Collection, 2001, West Auckland Research Centre, Auckland Libraries, GOW-003-0006. 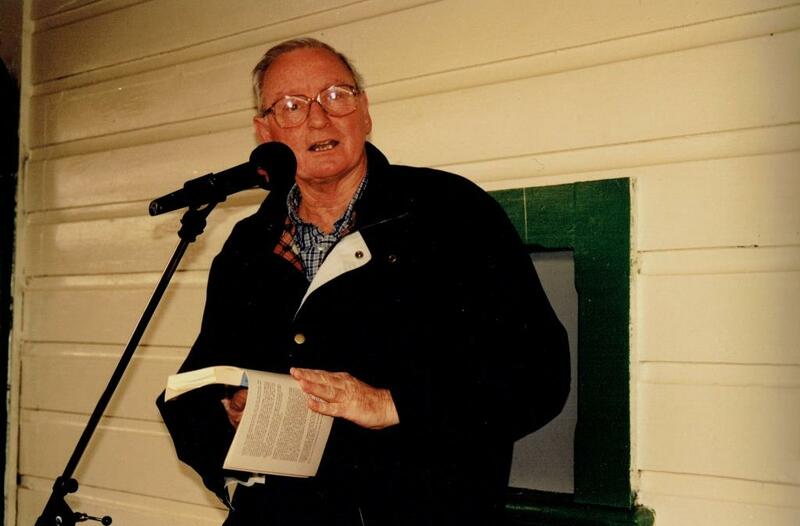 Ref: Gil Hanley, Maurice Gee reads from Going West on the Henderson Station platform, 1997, photograph reproduced courtesy of the Going West Books and Writers Festival Collection, West Auckland Research Centre, Auckland Libraries, GOW-003-002. LISTEN: Maurice Gee reading from Going West on the Henderson Station platform. Ref: Going West Trust, Maurice Gee reading from Going West on the Henderson Station platform, Going West Books and Writers Festival Collection, Disk 13, Track 1: 00.00-01.43, 1997, West Auckland Research Centre, Auckland Libraries, OH-1193. When the train journeys ceased in 2005 following changes to the Western Line, the Books and Writers Weekend carried on the spirit of the event from a new location at the Titirangi War Memorial Hall. Over the years the associated Storyfest, Poetry Slam and Theatre Season have, and still, entertain and challenge audiences and performers alike. 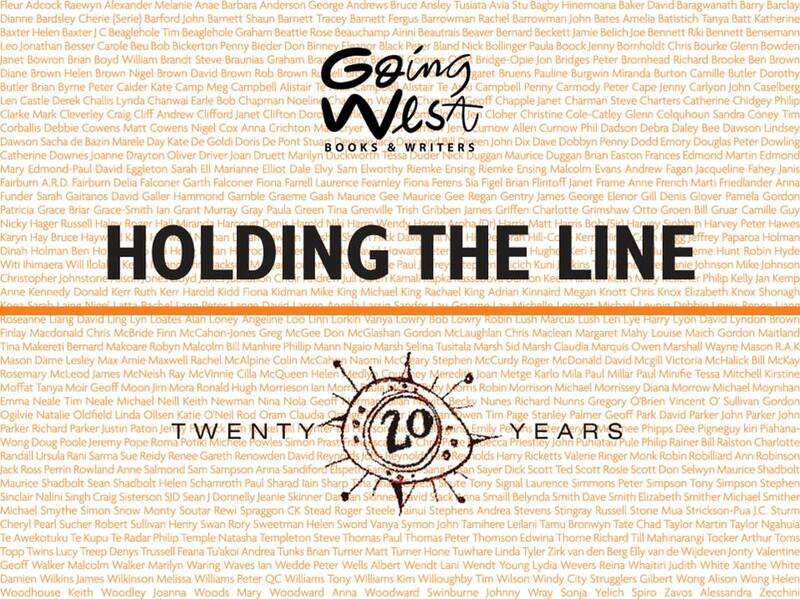 Ref: Going West Trust, ‘Holding the Line’ Exhibition branding, 2015, reproduced courtesy of the Going West Books and Writers Festival Collection, West Auckland Research Centre, Auckland Libraries, GOW-007-0023. 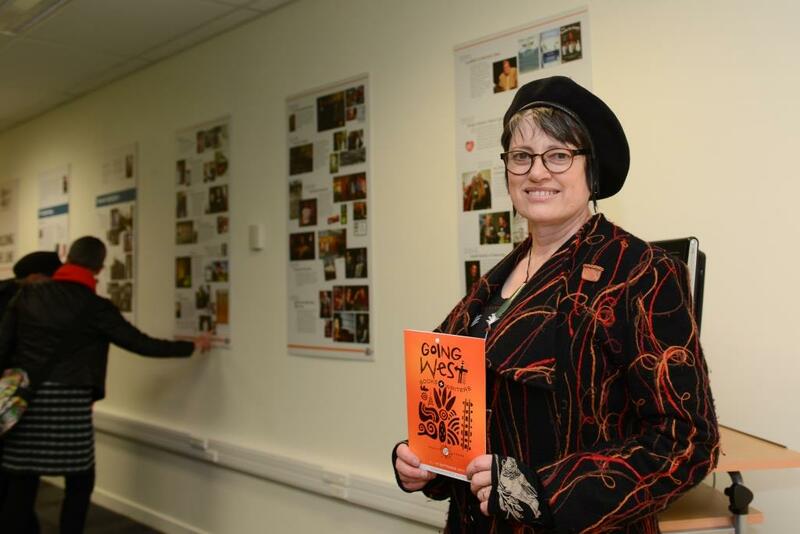 The ‘Holding the Line’ exhibition brings together content from the Going West Festival archives, held at the West Auckland Research Centre at Waitakere Central Library in Henderson. Curated by 2015 Associate Programme Director Robyn Mason, the exhibition includes text and images displayed over six exhibition panels to recreate the vibrant history of Going West, combined with a slideshow of images and selected audio recordings of sessions from across the festival’s history. Ref: Erica O’Flaherty, ‘Holding the Line’ exhibition in situ in the J.T. Diamond Room and Gallery, 2015. Ref: Liz March, Associate Programme Director of Going West Robyn Mason at the opening of ‘Holding the Line’, photograph reproduced courtesy of the Going West Trust, 2015. Many writers, artists and performers have contributed to Going West over the lifetime of the festival, in conversation about their own work or offering their voice in discussion with others. Renowned New Zealand authors Maurice Gee, Maurice Shadbolt, Emily Perkins, Keri Hulme, Margaret Mahy, Stephanie Johnson, Witi Ihimaera, Fiona Kidman and the late Dorothy Butler feature alongside poets Allen Curnow, C.K. Stead and Elizabeth Smither – to name but a few. The ubiquitous historian Michael King shares the festival limelight with iconic performers the Topp Twins, the late Graeme Brazier and singer/songwriter Mahinarangi Tocker. Veteran producer, writer and director Tainui Stephens appears as both chair and subject of numerous sessions. LISTEN: Topp Twins, ‘New Zealand icon – a song about our Mother'. 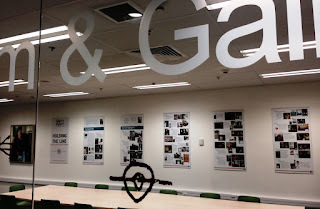 Ref: Going West Trust, Topp Twins, ‘Friday Night Get-Up’ – a song about their Mother, Going West Books and Writers Festival Collection, Disk 3, Track 1: 52.43 – 57, 1997, West Auckland Research Centre, Auckland Libraries, OH-1193. 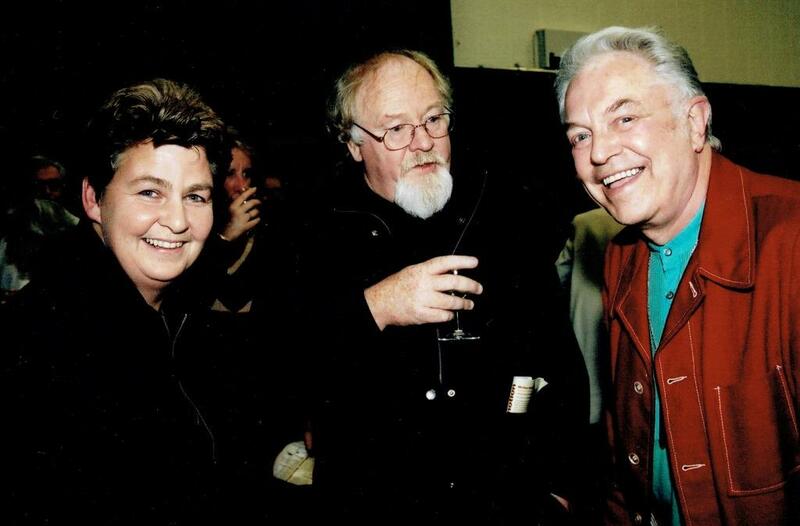 Ref: Gil Hanly, Lynda Topp, Peter Hawes, Max Cryer at the opening night of Going West 2002, photograph reproduced courtesy of the Going West Books and Writers Festival Collection, West Auckland Research Centre, Auckland Libraries, GOW-003-0007. LISTEN: Maurice Shadbolt in ‘Writing About our Town’. Ref: Going West Trust, Maurice Shadbolt in‘Writing About our Town’ , reproduced courtesy of the Going West Books and Writers Festival Collection, Disk 5,Track 2: 16:50-17:25, 1996, West Auckland Research Centre, Auckland Libraries, WOH-1012. Many memorable moments are captured in the photos and voices recorded during the festival, blending into a taonga that continues to increase in value each year. ‘Holding the Line’ brings these moments back to life to engage with past and present audiences and to evoke for future audiences the experience that is Going West. 2015 also marks the end of an era for Going West, as after 20 years of bringing the festival to life, Murray and Naomi now pass the mantle of programme direction to Robyn Mason and the associated guest directors to carry on. ‘So then. Get on with the dance. Clap and chant and stamp. Love and laugh and weep. Sing out, if you must. If you don’t, then have mercy on those who do and take pity on those who can’t. It is our furious and fatally human fever to know our clay as faultily fired and mortally flawed. Be gentle with strangers and forgive lovers all. For tomorrow we live’. ‘Holding the Line’ is open to the public until 30 November 2015 during Waitakere Central Library opening hours (9-5.30pm Monday-Wednesday and Friday, 9am to 7pm Thursday, and 10am-4pm Saturday and Sunday). The Going West Archive is available to search on the Local History Online database. 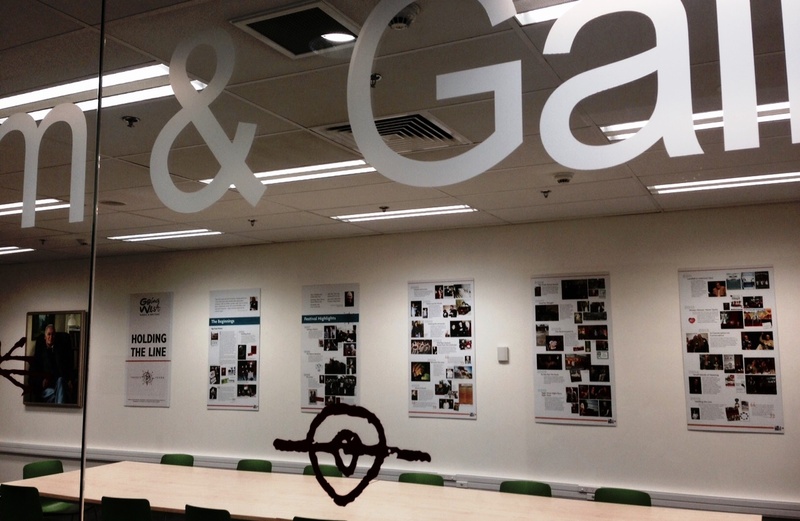 The collection includes festival programmes, ephemera, photographs and audio recordings, and is accessible at the West Auckland Research Centre in the Waitakere Central Library during the opening hours listed above. For more information, contact Erica O’Flaherty, Archivist at the West Auckland Research Centre, on (09) 3010101 x427865, or through email. Author: Erica O’Flaherty, West Auckland Research Centre. So much valuable material in this fabulous collection - how wonderful. Thanks for including sound clips into this blog - always great to hear the voices.